The Superman Fan Podcast: Episode #266: Superman Family Comic Book Cover Dated February 1959: Superman's Girl Friend Lois Lane #7! Episode #266: Superman Family Comic Book Cover Dated February 1959: Superman's Girl Friend Lois Lane #7! Superman's Girl Friend Lois Lane 7! 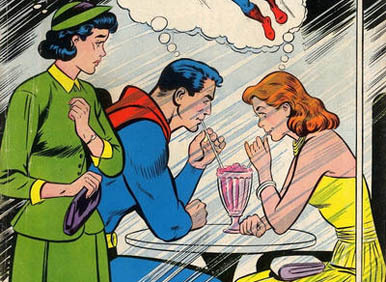 SUPERMAN'S GIRL FRIEND LOIS LANE 7, February 1959, was published around December 25, 1958. It contained 32 pages for a dime. The editor was Mort Weisinger, and the cover was pencilled by Curt Swan and inked by Ray Burnley. All three stories have been reprinted in SHOWCASE PRESENTS: SUPERMAN FAMILY vol. II and SUPERMAN'S GIRL FRIEND LOIS LANE ARCHIVE vol. I. - LOIS LANE'S KISS OF DEATH (8 pgs. ), written by Robert Bernstein (according to the Grand Comic Book Database, and drawn by Kurt Schaffenberger. This story was also reprinted in LOIS LANE ANNUAL 2. - WHEN LOIS LANE FORGOT SUPERMAN (9 pgs. ), according to the Grand Comic Book Database, was written by Alvin Schwartz, pencilled by Wayne Boring and inked by Stan Kaye. - THE GIRL WHO STOLE SUPERMAN (9 pgs. ), written by Jerry Coleman according to the Grand Comic Book Database and drawn by Kurt Schaffenberger. This story was also reprinted in 80 PG. GIANT 3. Elsewhere in DC Comics 34 titles carried the February, or February/March 1959 cover date, according to Mike's Amazing World Of DC Comics, and covered at the end of Episode 182, for the week of June 8, 2011. Since this episode covers a single comic book issue, the other ads and features are highlighted, including an article featuring TV'S LOIS LANE and LETTERS FOR LOIS. Next Episode: GIANT SUPERMAN ANNUAL 4! In 2 Weeks: SUPERMAN COMIC BOOKS COVER DATED FEBRUARY 1962: SUPERMAN 151 & ACTION COMICS 285!